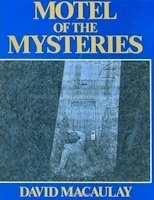 Here's an old review of Motel of the Mysteries, a not exactly brand new book by David Macaulay - an irresistible SF Archaeology spoof, describing a dig into a late-20th century site, and the interpretation thereof. Thought provoking, side-splitting, and highly readable. If you’ve ever talked to anyone involved with finding, digging up, and defining things people from the distant past left behind in the ground, then you know there’s a huge chasm of disdain between some of the professions involved in this. Especially, there’s not much love lost between the people who find, dig up, and document the finds (aka the Archaeologists), and the people whose job it is to make sense of what was found, what it is, how it was used, and what it meant to its owner (aka Anthropologists). A stone axe – clear case, usually, unless it’s unused and special, in which case it was ceremonial, indicating its owners’ wealth and special status. A strangely shaped, carefully crafted, obviously expensive and unusual thingamajig? Must be ceremonial (cue drum roll for running gag). Why do I mention this here? Well, this is an SF-Archaeology story, but nearly all the funny bits derive from that dichotomy – and mostly they’re poking fun at the interpretation of what’s being found. The story plays in the year 4022 AD. This in itself is fairly arbitrarily chosen (read: far in the future), and is, in my opinion, ways too far out for what is being found. But let’s not jump ahead, or have common sense get in the way of a good spoof, ok?. Earth, and specifically North America, where this story plays, encountered an ecological catastrophe in 1985. The book is fairly vague about what happened, and the bits it conveys are not all that believable, but who cares – no impact here (and who says all the theories about meteorites, climate change etc in museums are any better?). 20th century society and ‘culture’, as we know/knew it, was more or less erased. Very few records and memories remain, and society has regressed to some Victorian model, but with more technology it seems. Howard Carson is an old-fashioned, wellborn gentleman with more money then sense, and is happily wasting it away on a number of hare-brained schemes. An upper class time-waster, essentially – just read some stories by Jules Verne, for example, and you know the type. Together with his assistant Harriet Burton he stumbles upon an Archaeological sensation – an intact set of burial chambers, untouched by grave robbers, fully intact. Sorry, the rooms of a cheap motorway motel, covered up during the aforementioned catastrophe, with one person in the dingy room, the other one deceased in the bath tub. He starts to excavate, catalogue, and interpret. The book is organized in four sections – the History of the world, the story of the discovery, the treasures found, and, of course, marketing in the shape of Souvenirs and quality reproductions of the treasures for sale! There is only a limited amount of fairly large print text in this large format book. At least half the space is taken up by line drawings, illustrating the story and the treasures found – and these are the main source of mirth, too. All in all I think this is an excellent book – if you know anyone interested (or working!) in Archaeology then this is the perfect present for him or her. Underneath all the poking fun is the very relevant question of how we know that the interpretations we make, and that we see in museums, are any better than the completely wrong ones here. The book very clearly suggests an answer: unlikely. An excellent send-up of Archaeology as we know it – with a serious undertow, like any good farce. Highly Recommended.